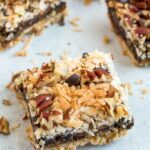 Healthier magic cookie bars made grain-free, gluten-free and vegan with homemade sweetened condensed coconut milk. Last month I went to Isaac’s school for a holiday celebration and as luck would have it a parent had brought in Magic Cookie Bars for the teachers. Remember those bad boys? 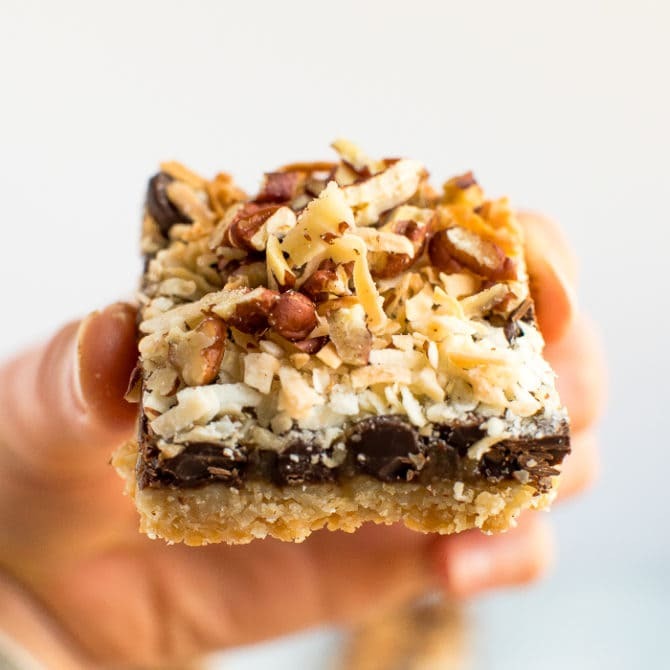 Some people call them Seven Layer Bars but they have a graham cracker crust, chocolate chips, coconut and sweetened condensed milk… so rich and delicious! My mom used to make them and they were one of my favorite holiday baked goods. At Isaac’s school that day, I couldn’t resist having a bite (or two). It was just as a good as I remembered it: before long the wheels started turning in my head and I had my mind set on making a version of my own. I can’t really call these healthy because they’re still decadent, but they’re made with wholesome ingredients and a bit healthier. And I have a feeling that they would make an excellent Valentine’s Day treat to make for that special someone (or your family, friends, co-workers and neighbors)! Having tasted the classic version only a day or two before I made this variation, I can honestly say they look and taste like the real deal. You could easily take them to a party, not tell anyone that they’re grain-free, dairy free and made with sweetened condensed coconut milk and people would go crazy for them. 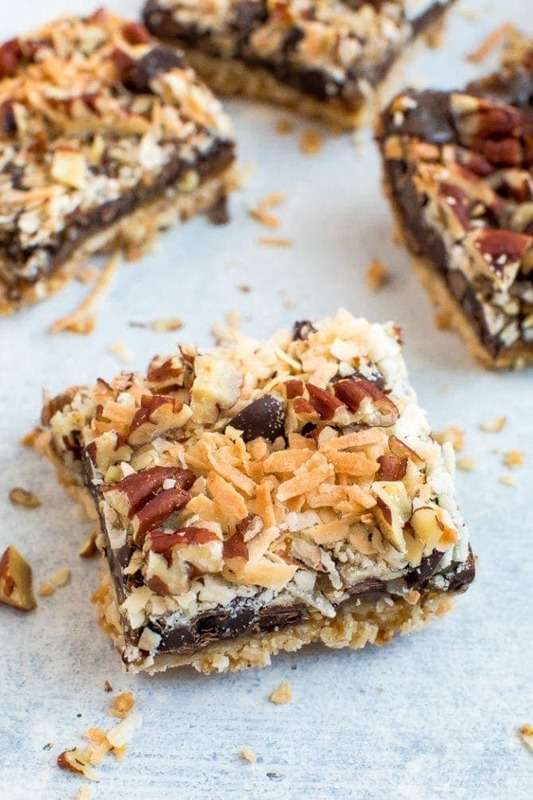 Chocolate + coconut + nuts = magic. I hope you all like these as much as we do! 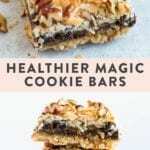 If you make these healthy magic cookie bars please be sure to leave a comment and star rating below letting me know how they turn out. 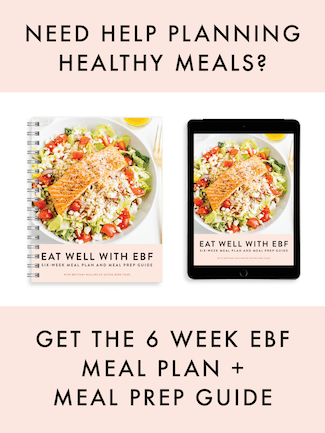 Your feedback is so helpful for the EBF team and other EBF readers! Preheat oven to 350°F and line a square (8×8) glass baking dish with parchment paper. Combine all ingredients for the crust in a large bowl and press firmly into the prepared pan. Bake for 12 to 15 minutes until your crust is golden brown in color. Remove from oven and cool on a wire rack. While crust is cooling, in a saucepan over medium heat bring coconut milk and sugar to a low boil, reduce heat and simmer for approximately 45 minutes, stirring frequently until the mixture has reduced by half. The coconut milk mixture should be thick reduced to about 3/4 cup. Remove from heat and cool slightly. Pour the sweetened condensed coconut milk over the crust and spread to the edges. Place in oven (still at 350°F) and bake for about 30 minutes, until edges are browning a bit. Remove from oven and cool for 30 to 60 minutes on a cooling rack. Once the bars have cooled a bit, place the pan in the refrigerator to allow the bars to set-up for at least two hours (or overnight). If you’re in a rush you could put the bars in the freezer for an hour instead. After cooling, lift the parchment out of the pan and place bars on a cutting board or other flat surface. If the bars are coming from the freezer, you may need to let them thaw for a few minutes before cutting as they will be pretty firm. 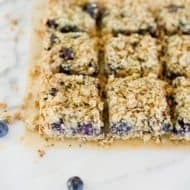 Cut bars into 16 squares and dig in! Any leftover bars should be wrapped or placed in a sealed container. They can be left out for a couple days or stored in the fridge or freezer for longer storage. Recipe adapted from Simply Living Healthy. These look great!! Right up my street! I hope you have a good trip, the cold is brutal here! The Brooklyn Brewery tour is great and it’s free on weekends. These look incredible! Is the difference between flaked and shredded coconut major? Or can I sub shredded for both? These bars look totally delicious! I love that they’re vegan. beautiful job! These look amazing! I have to try these. Enjoy your weekend in the city! If you haven’t been to Pure Food and Wine restaurant.. that is a must! Amazing raw vegan food . The menu is like heaven for a vegan 🙂 . These are my boyfriend’s favorite dessert! I never thought to test out a healthier (basically, dairy and gluten free) version, but if I do that means that I get to do some of the tasting too! Wow these look so good! You are an inspiration. I will definitely be trying these! What a great recipe Brittany! So glad Isaac called to let us know you did a redo! My coworker has also made an autumn magic cookie bar recipe (think it has apples and maybe pumpkin too). I’ll send you that one if you want to experiment with that too. Can’t wait to try the recipe. I wonder if there is something that can replace the almond flour since Caroline can’t have nuts. I always do a batch without nuts for her when I make the unhealthy version. Hope you and Mr. Isaac have a great time in NYC. 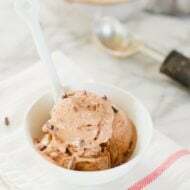 I have made a similar version using chocolate chip cookies and coconut oil as the base.. and instead of nuts on the top i used pretzels… super yummy for nut free! These look beyond amazing! I will definitely be trying these soon, thanks for posting the recipe! My aunt and I used to make the original version every time I visited her. I sent her a link to this recipe, and she’s so excited to try it. Personally, I love how it’s still decadent and rich. Can’t wait to try it myself. I made these tonight and they were REALLY GOOD!! 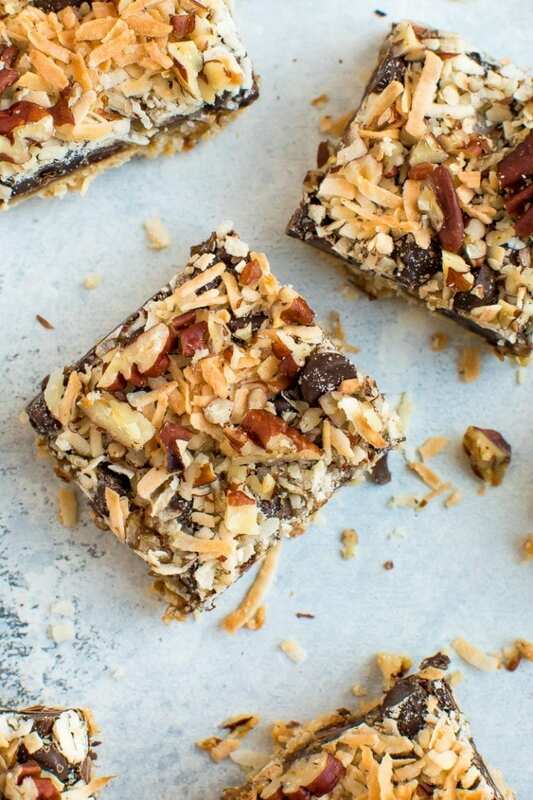 My gluten free husband loved magic cookie bars so I’m glad I found a good gf version for him. I made these this weekend and they were fantastic! My friends loved them and there’s no way anyone would be able to tell these were made with 100% wholesome and nourishing ingredients. I’m going to make them for my colleagues this week and then tell them how healthful they are only after they’ve tried them. I get such a kick out of that. Thank you for share.I like to eat cookies.Wow these look so good! These were good. But I couldn’t get the coconut milk/coconut sugar to reduce and thicken. Any tips? hmmmm.. it does take quite a long time (about 45 minutes) — did you have it simmering for that long? Perhaps it wasn’t at a high enough heat during the simmer? I would also make sure the top of your pot is off while simmering. Hope these ideas help! I made these cookie bars last week and, even though they were slightly singed, they were delish! I made them again yesterday and they were even better because I didn’t burn them this time! 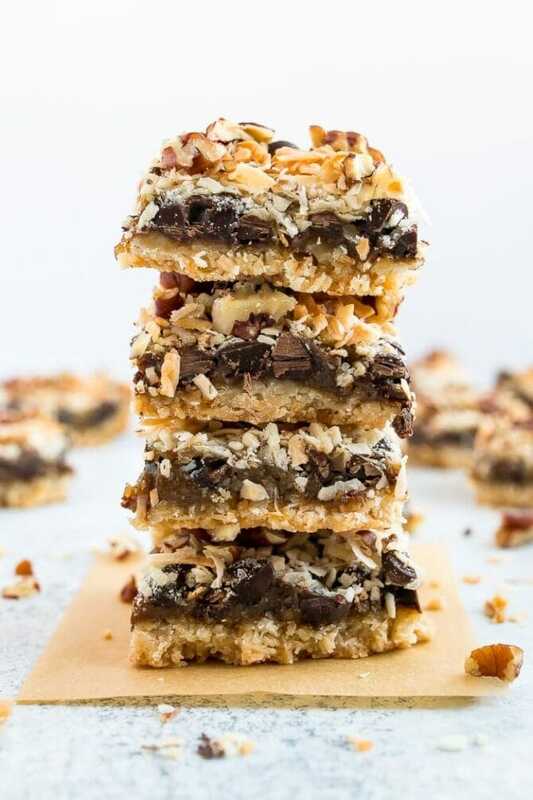 My mum used to make the 7 layer cookie bars on rare occasions when I was a kid, and I remember them as yummy, delectable treats – and very rich. This vegan, refined-sugar free recipe is just as good – actually better since they are so benign. Seriously?! I haven’t had these in SOOO long! Can’t wait to try them! This recipe looks wonderful! I’m planning to make these for the holidays this year. 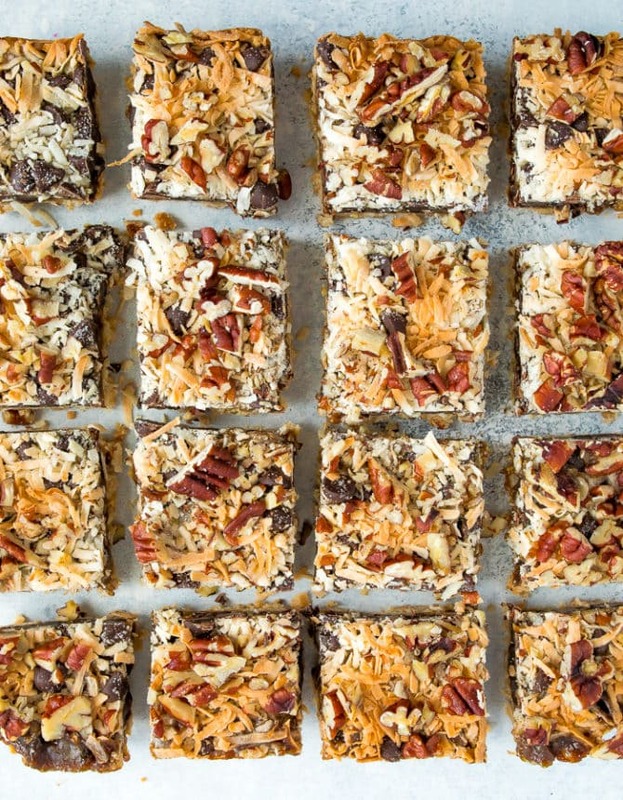 My dad requested a healthier version of magic bars, and I think this recipe looks like the perfect fit. Yum! These sound absolutely amazing! These look soo yummy! Thank you so much for offering vegan, gluten free recipes – it’s such a huge help. this is pretty sweet!!! my family is obsessed with classic magic cookie bars, i wonder if i can trick them with these. I bet they’ll love this version. They’re just as good. 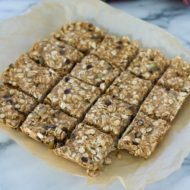 Thank you for sharing this recipe – is it ok to substitute other kids of flour – eg coconut flour, oat flour? what would that change the baking time?